Rescue your beloved from kidnappers. Kill the bandits attacking your home. Read the note to discover where your spouse is. Rescue your spouse through violence, or pay the ransom. At some point you may arrive at your newly constructed house to find a group of bandits attacking it. Kill the bandits and then loot them to discover a note that explains why they were attacking. You will discover that your spouse has been kidnapped by Rochelle the Red, and she is demanding 5000 gold for your spouse's safe release. 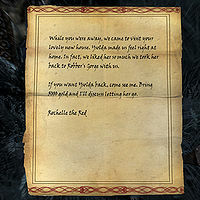 Travel to Rochelle's hideout, as indicated by the note, and make your choice to deal with the situation through violence or by paying the ransom. If you pay the ransom, your spouse will be safely returned to you. If you choose violence, you will need to kill all the bandits in the dungeon to safely rescue your loved one. The bandit camp will be in the same hold as the house from which your spouse was taken. This quest will not occur unless your spouse is living in one of the three constructable homes added by Hearthfire, nor (obviously) will it occur if your spouse is currently following you. If you have a housecarl (Gregor, Rayya, or Valdimar) staying in the house where your spouse is, or if any of these are your spouse[verification needed — see talk page], Rochelle the Red will attack you outside your home rather than kidnapping your spouse. The quest may automatically complete itself. If this happens your spouse should be at your home. The best solution is to load an earlier save after reading the location of the bandits and go directly there instead of going to your home. Whether the quest has been completed or not, your spouse may become badly bugged and walk backwards. This bug is fixed by version 2.0.1 of the Unofficial Hearthfire Patch. Return to a save that is far back enough that the quest has not been triggered, and move your spouse to a city. You can solve this bug by opening the console, clicking on your spouse, and using the resurrect command. If your spouse becomes bugged somewhere other than home, you can find them by using player.moveto <RefID#>. Nudging the spouse might set them back on the path, but they will still be bugged when arriving home. Some bandits may be hostile, either causing Rochelle to turn hostile as well, or attacking you while you're talking with her. Rochelle's Intimidate options are not marked as such. Although technically a repeatable quest, it will only repeat once every 50,000 hours or a bit less than six in-game years. This bug is fixed by version 3.0.3 of the Unofficial Skyrim Legendary Edition Patch. The spouse may be "rescued" before the quest ever begins if you adopt a child. If you choose for your new child to reside in a different house than your spouse, the spouse will be sent to the new house. There, your spouse will speak as if you're just then rescuing them, before resuming normal dialog. Bandits are found attacking your spouse's original home, where you can get the quest in your journal. The quest auto-completes before too long. ? The following empty quest stages were omitted from the table: 5, 10, 20, 30, 60, 70, 80, 100, 120, 150, 200. On the PC, it is possible to use the console to advance through the quest by entering setstage BYOHHouseBanditAttack2 stage, where stage is the number of the stage you wish to complete. It is not possible to un-complete (i.e. go back) quest stages, but it is possible to clear all stages of the quest using resetquest BYOHHouseBanditAttack2. This page was last modified on 28 February 2019, at 01:11.